Thermal Inkjet print cartridges require little to no routine maintenance. 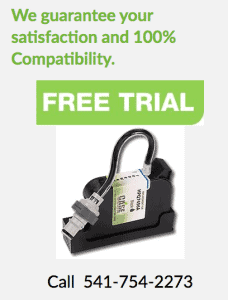 Users can quickly problem-solve poor print quality by cleaning the printhead. The proper use and handling of these cartridges helps ensure optimum print quality and longer print cartridge life. In a case or carton printing environment, paper and dust fibers can build-up on the cartridge nozzles and degrade the print quality. The specific process for cleaning inkjet printheads depends on the type of ink inside the cartridge. For inks that print on POROUS packaging surfaces like corrugate, proper cleaning requires just two materials: deionized water, and a lint-free cloth. Contact CASE to purchase the recommended cloths, also known as tex wipes. Spray deionized water onto lint-free cloth. NOTE: Do not use tap water as these water sources are more likely to contain minerals that leave deposits on or in the printhead nozzles. While holding the top of the print cartridge, wipe slowly and lightly across tip of the long edge with the printhead facing down. NOTE: Applying too much pressure while wiping may scratch the printhead. Wipe one or more times until a consistent line of ink is transferred to the lint-free cloth. Inks intended for printing on NON-POROUS packaging surfaces do not require deionized water as part of the wiping process. These inks are solvent based and therefore already contain what’s needed to moisten the lint-free cloths during a cleaning process. Otherwise the routine for cleaning solvent print cartridges is identical to the process detailed above for porous substrates. All other print technologies have a substantially more complex process for cleaning printheads and solving poor print quality. 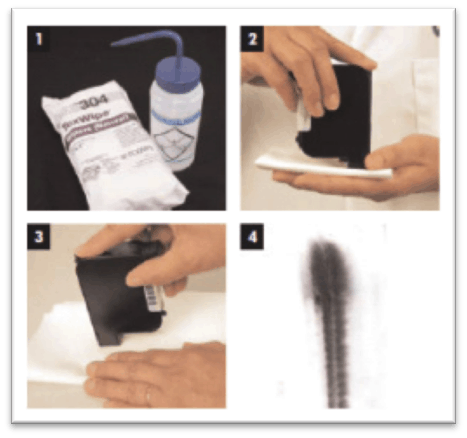 For thermal inkjet, the wiping instructions are very straightforward and can be completed by any operator. In situations where the printhead nozzles have been damaged or the cartridge no longer jets ink reliably, replacing the old cartridge with a new one also delivers a brand new printhead. CASE Printing Solutions is an expert when it comes to HP industrial inkjet systems. Whether you’re running a high-speed mail addressing system, or a 24/7 packaging line, CASE can help. Call or email us for assistance to: (1) troubleshoot your inkjet printer, (2) implement a bulk ink system, (3) buy & save when purchasing original and remanufactured HP ink products, (4) rebuild your print system and thereby extend its useful life, and (5) upgrade to a new print system.